Only 12 percent of Democratic senator Doug Jones's first quarter fundraising haul came from his home-state of Alabama. 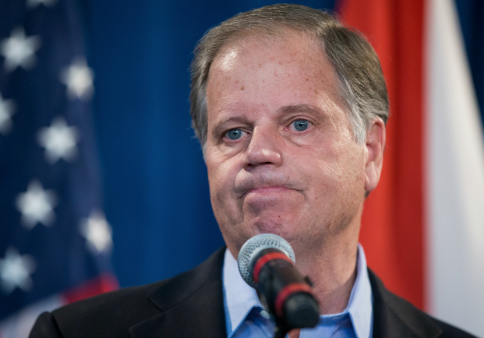 Jones, the most vulnerable senate Democrat seeking reelection in 2020, raised more than $1.64 million during the first quarter of this year, according to campaign finance reports made public by the Federal Elections Commission on Monday. Of the total, more than $918,000 came from large individual contributors, while slightly more than $235,00 came from small dollar donors. The filings indicate the rest of Jones's first quarter haul (more than $425,000) came from PACs affiliated with large corporations and liberal advocacy groups based outside of Alabama. Jones's fundraising numbers appear healthy at first glance, especially when compared to the fact that his most high-profile Republican challenger raised $1.2 million in the same period. As noted by the conservative Alabama news website Yellowhammer, however, the numbers may not necessarily translate into support with voters. A breakdown of Jones's large individual contributions show that only 12 percent (a little more than $107,000) came from Alabama residents. In contrast, Jones raised more than $150,000 (17 percent) from California residents and more than $148,000 (16 percent) from residents of New York. A number of the out-of-state donations came from prominent liberal activists like Jonathan Soros, son of the billionaire Democratic donor George Soros. The senator's in-state donations rival the $100,000 his campaign raised from American citizens living abroad during the first quarter. It is unclear what portion of Jones's small dollar donations were from Alabama as the FEC doesn't not require campaigns to disclose the names and residency of those giving less than $200. Jones's reliance on out-of-state donors is nothing new. During the 2017 Senate special election to replace Jeff Sessions, who resigned to become attorney general, more than 84 percent ($16.9 million) of Jones's campaign donations came from outside of Alabama, according to the Center for Responsive Politics. The outside cash helped Jones win the seat by less than 22,000 votes after his Republican opponent, Roy Moore, was waylaid by sexual misconduct allegations. The Washington Free Beacon previously reported the Jones campaign was targeting heavily liberal states such as California, Massachusetts, and New York with its digital campaign ads. This entry was posted in Politics and tagged Doug Jones. Bookmark the permalink.